Korean Beauty Wonder ‘The Face Shop' Reveals Must- Have Beauty Products for the Season! 26 March, 2018, Dubai, United Arab Emirates: The combination of nature and science is truly one that is hard to beat. Korean beauty wonder, The Face Shop is pleased to introduce a host of exciting releases to keep your beauty needs in check for the coming season. Truly a one stop shop solution for all your vanity needs, The Face Shop has rounded up some must-have picks from their skincare and makeup collection. One for the lippie lovers, a lipstick to create perfectly defined lips without the worry of crossing the lip line. Featuring a flat square tip to draw on perfectly, the lip colors come in both glossy and matt variants in six different shades of brown, pinks and reds. Boldly pigmented, the unique flat square shape enables any makeup look you want to express! Imagine, intense cover in one swipe, sounds like a dream isn’t it? The Face Shop makes it a reality with the all new Miracle Cushion – Intense Cover. Not only does it offer long lasting cover but the added benefits of UV protection, brightening effect and anti-wrinkle functionality all in one, takes this cushion to a whole new level. The cushion is available in 6 natural color shades. Korean folk tales defined beauty with vitalizing, invigorating and smooth skin. Inspired by the stories of beautiful Korean women and their secrets, The Face Shop brings forth an anti-aging care line that delivers the essence of traditional Korean beauty regimen like no other. The range utilizes three kinds of natural ingredients formulated with traditional herbs and flower extracts. Thus, improving your skin’s vitality to a softer texture and brighter complexion that has never been easier. Yehwadam Revitalizing anti-aging herbal line comes with complete skincare essentials ranging from toner, serum, emulsion, eye cream and face cream. As the name suggests, Dr. Belmeur is a true jewel in The Face Shop crown.A derma cosmetic skincare brand, Dr. Belmeur has all its products formulated with skin friendly plant based ingredients delivering long term skin benefits. Offering daily repair range specifically targeted towards dry and delicate skin and a clarifying range for acne-prone and oily skin. The range comes equipped with a complete set of products including cleanser, moisturizer, toner and a salt crème to tackle issues like sensitivity, dryness dehydration, excessive oiliness and acne. You can’t have Korean beauty without the mention of sheet masks. 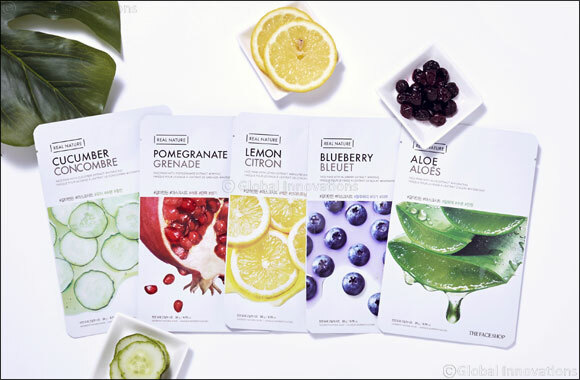 The Face Shop carries an extensive range of sheet masks by Real Nature. Each mask sheet is created to target a specific skin problem, thus enhancing your skincare routine for naturally healthier looking skin. These naturally derived sheet masks come with high adhesiveness and are formulated with mild ingredients that come in three types; essence water, serum, and emulsion. So, whether you’re in the mood to slap on some avocado or cool down with a cucumber, there’s a mask for you!